On Landvættir: An Exploration of Primary Source Examples and Suggestions for Further Reading. Originally posted on Tumblr on: February 27th, 2017. No question is ever a hassle, my friend. I am more than happy to share my knowledge regarding vættir (nature spirits). Not all vættir are land sprits, though, for those are often referred to as landvættir. Still, vættirof the land seem to be the most common and most often interacted with, so I will focus our discussion on them specifically. To be honest, they are a particularly favorite subject of mine! I wrote a lot, so I am structuring this answer as an essay, which I hope you do not mind. It should help to organize the content! It is not surprising that we know fairly little about them, because they are quite elusive in our surviving texts. This is mainly because they are not always referred to directly being ‘landvættir’, but rather are referred to indirectly. The landvættir, from what I know of them, do not even appear in our eddic sources, but perhaps indirectly and vaguely, if they do. I also do suppose some people align the landvættirwith the álfar (elves), which is reasonable. If this is done, they do appear in eddic material, in a way. Yet, even so, they still remain quite vague even in those sources. In the end, references to the landvættirseem to mostly be hidden gems scattered throughout other materials, such as Landnámabók (Book of Settlements) and the Íslendingasögur(Sagas of the Icelanders). From that, we can gather a few things: that there are many more types of vættir than just those who inhabit the land (although those will be the ones I mostly focus on in this discussion), that there is a long, evolving tradition surrounding them that lasts even into current times, and that they held considerable influence over the lands they inhabited, and even over the people who lived in those lands. Thus, these landvættir have a long history, stetting far back into at least the medieval period. From this example, we can tell that they were very powerful. Not only that, though, but that the land was “full of landvættir.” Yet, this example shows their menacing power to outsiders, but what about those living among them? For this, we shall turn to the Landnámabók. In this example, Hafr-Bjorn befriends a landvættr that is referred to as a cliff-giant, or, in some other versions I believe, as a cliff or rock-dweller. He was actually offered this friendship from the landvættritself in a dream, which demonstrates a possible method for communication with a landvættr. Furthermore, this example reveals the benefits to such a relationship, which was usually prosperity in land-related activities, such as the raising of livestock and fishing. Hafr-Bjorn and his brothers must have treated these spirits with great respect to have earned their friendship, and the benefits of such relations are clearly worthwhile. Also, this example shows us that seeing the landvættir required a special skill, or “second sight,” so not everyone could nor can see these spirits. Hjorleif was a blot-brother of Ingolf’s, the alleged first settler of Iceland. (5) He was killed by a another man’s (Dufthak) slaves while looking for a bear in the woods. (6) Yet, it was also mentioned earlier that he “would never sacrifice to the gods.”(7) Regardless, his death laid a bad omen across that land, which is felt even when, many years later, a settler named Olvir comes along (as told above). This example, although short, demonstrates even the native fear of the power that the landvættir held, and that if their land was disrespected, it would likely not result in peaceful times for the settlers living there. This example is fascinating, because we kind of must piece things together to truly get the depth behind it. Thorstein was sacrificing the a landvættr that lived in a waterfall. It seems that this landvættrgranted him this ability of foresight to enhance his skill in maintaining his sheep. I find this to be the case because, at the end of this example, the sheep are ‘returned’ to the waterfall once Thorstein passes away, therefore connecting the sheep to the waterfall through Thorstein. Once he was gone, the connection was broken and the landvættr took what was rightfully its. All of these examples serve to demonstrate the various aspects of the landvættir that you asked about. They were honored much like the gods themselves were, it seems, although suitable information to ‘prove’ this is still to be desired. They either came to you in a dream, like one did with Hafr-Bjorn, or they would be won over through generous sacrifice, as was seen with Thorstein. They were respected and given appreciation to keep them in good spirits. After all, when angered or ignored, they could cause fear, as seen with the case of Olvir, or even destructive and threatening, as seen in the Saga of Olaf Tryggvason. If Landnámabók was not quite satisfying enough, there are still a few examples to be explored from Egil’s Saga and The Tale of Thorvald the Far-Travelled. For those reading this that are already well-read, it may seem odd for me to be leaving out Bard’s Saga. That example deals with vættir-related subject matter intensively, and I would rather recommend that as a full reading than except it as an example on this post, so I will return to Bard momentarily. “He (Egil) took a hazel pole in his hand and went to the edge of a rock facing inland. Then he took a horse’s head and put it on the end of the pole. In this example, we can see that people can actually ‘control’ the wrath of vættir, and they can even turn this wrath onto others, if they are skilled enough. Yet, in the case of Egil, he was wronged, and so he had right on his side (see footnote 9 for detail). Perhaps, then, vættir have a sense of justice even. Nonetheless, I suppose this is a sort of ritual, in which one would target their enemies with strong words, runes, and insulting imagery. Yet, it does hint that the vættir did play a social function as well. This was already indicated by the landvættir, who often protect the land and the people who dwell there, if they have a good relationship with them, of course. Thus, vættir can either protect people or attack them, depending on their relationship with the user and his or her skill. In this example, the ‘theme’ of a vættr is used very strategically by the author, so we must take caution in how we read this source. In the quote below, Thorvald talks with his father, Kodran, about converting to Christianity. Kodran responds (at first) by telling Thorvald that he has a ‘prophet’ who lives in some nearby stone, and that this prophet helps him in many ways. The author treats this prophet as a demon, although it seems that this figure is being built upon the tradition of the vættir. ‘Where does your prophet live?’ asked Thorvald. Thorvald asked how long he had been living there. A few things should sound familiar by now. This is a landvættr, for he dwells within a stone. It also seems that we can conclude that landvættir are prophetic, because both here and with Thorstein Red-Nose in Landnámabók. The landvættir also tend to earthly things, such as livestock and farms, as we have seen with Hafr-Bjorn (goats), Thorstein Red-Nose (sheep), and now here with Kodran (cattle). The ‘prophet’ is also very old, which would not be surprising for a landvættr. Thus, it is not unreasonable to notice the connection here with landvættir, even though this tale never explicitly uses the term, which brings back a point made earlier that references to landvættirare like hidden gems scattered throughout our sources. H.R. Ellis Davis, Myths and Symbols in Pagan Europe: Early Scandinavian and Celtic Religions. (Syracuse University Press, 1989). This book would be the best way to learn about the material from a reliable place, and without scavenging the primary source material for information. Google has an eBook version that contains a preview, if you would like to check that out before purchasing. For the most direct information on landvættir, I recommend special attention be given to pages 102 through 133. In fact, I tried to make use of the examples discussed in her book as well, so that, if you choose to read it, things should be more familiar to you already. The whole book seems to be quite the gem, though, so you may be interested in that text for other purposes as well. Regarding primary sources, you can investigate any of the sources I covered in this post by looking at the relevant footnotes. I will say, though, that I have mostly pulled what is relevant from the sources that you would have easy access to. For example, I would hate to recommend Egil’s Saga just for you to only have that portion of chapter 58 to read about regarding landvættir. Ralph O’Connor, Icelandic Histories & Romances. (Tempus, 2004). If you have trouble, don’t hesitate to let me know, because I would be more than happy to try to help you find a way to read that saga. So, in the end, what have we learned? Vættir are nature spirits, and people often sacrificed to them. Many of these vættir were called landvættir, but only those who lived in features of the land, such as waterfalls or large stones. Landvættir (at least) can be in the form of animals, so they do not always take a human form. Vættir could be friendly, but they could also be spiteful when angered, ignored, or disrespected. Some landvættir protected entire regions or countries, whereas others protected local farmsteads. Sometimes they did not protect for the sake of humanity, but for themselves, and so if you are not on friendly terms with them, they will likely cause you great trouble. Many people gave offerings to the landvættir to build a stronger relationship with them and the land. These offerings were not always material, but could also be offerings of respect and recognition, because some landvættir became friendly with people without the need for a formal sacrifice. Sometimes they would come to people in dreams, but only if they wished to. A landvættr could offer a friend many gifts, but mostly prosperity in regards to the raising of livestock, in farming, and even in advice. Another frequent gift they would offer would be the gift of prophecy or foresight. The vættir could be ‘manipulated’ in such a way to incite trouble for a foe, although this seems to require careful skill, for the user would not wish to disrespect the vættir him- or herself, lest they wish to incur their wrath. Yet, this could also be due to good relations. Despite not holding a prominent place in Eddic material, other sources suggest that the vættir placed a very central and regional role within the confines of Norse heathenism, and even beyond. Many of the practices told above would ahem been a part of daily life, and can best be summed up as a deep respect, and sometimes fear, of the power of nature. The tradition surrounding the vættir has lived on for quite a long time, existing likely even before Iceland was settled. The vættirstill live on today in folklore and in national images such as Iceland’s coat of arms. Seems like we have learned quite a bit! Of course, this is perhaps only just the surface of the complexity that surrounds the vættir, but it is still quite rich and rewarding. Besides, I have only discussed examples from Iceland. Nonetheless, I do hope that you and others benefit from this post, despite its possibly daunting length. Feel free to reach out to me in the future if the need arises. I am always happy to discuss these things! 1. Viðar Hreinsson, Reference Section: Glossary, in The Complete Sagas of Icelanders: Including 49 Tales, Vol. V, edited by Viðar Hreinsson, Robert Cook, Terry Gunnell, Keneva Kunz, and Bernard Scudder, (Reykjavík: Leifur Eiríksson Publishing, 1997), 413. Fig.1. 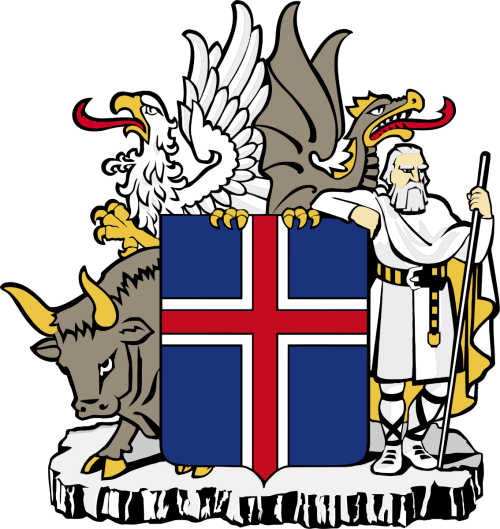 Coat of Arms of Iceland, Wikimedia Commons. 5. Ari Thorgilsson, The Book of the Icelanders: Íslendingabók, translated by Siân Grønlie. (Viking Society for Northern Research: University College London, 2006), 4. 9. Bernard Scudder trans., Egil’s Saga, in The Complete Sagas of Icelanders: Including 49 Tales, Vol. I, edited by Viðar Hreinsson, Robert Cook, Terry Gunnell, Keneva Kunz, and Bernard Scudder, (Reykjavík: Leifur Eiríksson Publishing, 1997), 114. (Chapter 58) I recommend referring to the Penguin edition (page 119), due to the expense of the version I have used in writing this post. “Land spirit, the law-breaker – (‘land spirit’ appears here as ‘landalfr’). the man who slew his brothers. for driving me from this land. Prev Snorri Sturluson: Keeping the Old Alive with the New. Enter your email address to become a Hall Companion and be the first to receive new posts by email!